Sandy Ridge Construction Ltd. brings you the personal touch needed in designing, constructing and finishing the home of your dreams with 36 years of experience. We are an ICF Builder using AMVIC 3.1 blocks in Salmon Arm, Sicamous and Chase. Contact us for more details. A new development featuring 53 single family home lots with high efficiency ICF construction. Variety of plans, RV Parking. Visit our project gallery to see jobs we have completed and some under construction. Get inspired then call us about building your dream home. Check out our exclusive designs. Don’t see what you’re looking for? We can create a custom plan for you! Contact us for a consultation today! Affordable, Energy-Efficient Design was Key – The Country View Estates in Salmon Arm, British Columbia, was recently recognized as one of the most innovative Development projects in North America. 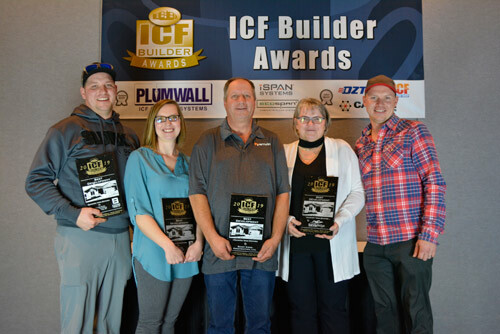 The honor was presented as part of the ICF Builder Awards, an inter national competition designed to showcase the advantages of building with Insulated Concrete Forms, commonly called ICFs. Thank you for considering building with Sandy Ridge Construction Ltd.
© 2019 Sandy Ridge Construction Ltd. Salmon Arm, BC. Site Design by Prima Design.